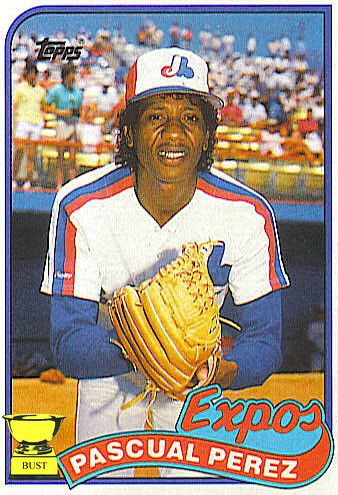 What a beauty: Pascual Perez is a beautiful man. Look at those soggy locks dripping sensual ooze onto his shoulders. The dripping strands cover his ears and have slipped past the front of his hat onto his forehead in the sexiest of ways. The hat itself accentuates Perez's perfect facial bone structure. His cheek bones lift his skin high, allowing the flaps to fall gracefully over his face. Perez's nose is the size of a pro-wrestler's fist, not at all making the pitcher look like a poodle. The glistening gold teeth add pizazz to the Perez package, perhaps drawing as much attention as his 5-inch Adam's apple. All told, few men encapsulate beauty this well. How hard is it to get activator out of a jersey?